You start to see the little human they are becoming. 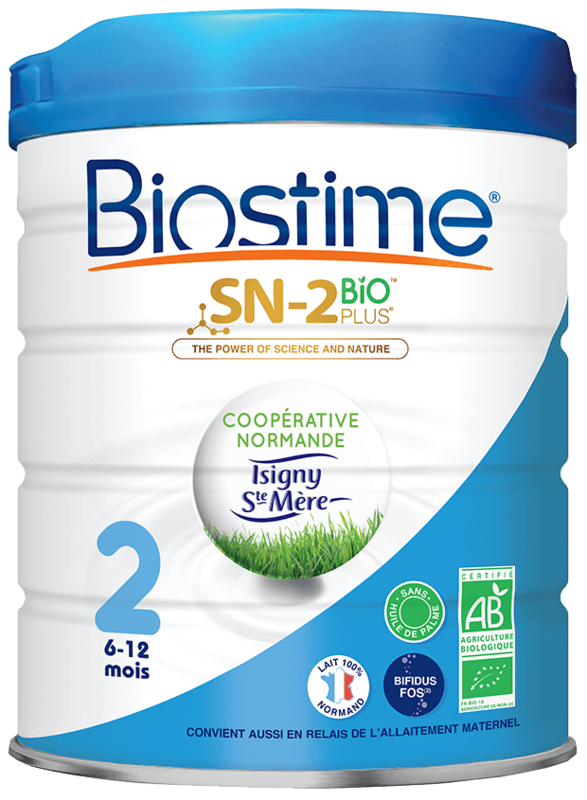 Biostime® SN-2 BIO PLUS™ Premium Organic Follow-up Formula provides comprehensive nutrition to support the needs of growing babies from 6 – 12 months who are not being breast-fed or are mixed feeding. Made from certified organic ingredients, this follow-on formula has been scientifically developed to provide quality organic nutrition for growing infants. Skimmed milk*, vegetable oils* (sunflower oil, rapeseed oil, coconut oil), cream*, maltodextrin*, lactose*, demineralized whey*, fructooligosaccharides (FOS), emulsifier (soy lecithin), arachidonic acid (AA), calcium chloride, sodium L-ascorbate, docosahexaenoic acid (DHA), sodium chloride, L-cystine, ferric pyrophosphate, tricalcium phosphate, magnesium chloride, calcium hydroxide, calcium carbonate, probiotics (Bifidobacterium infantis – contains 1 x 108 cfu/100g at time of manufacturing), DL-alpha-tocopheryl acetate, antioxidant (mixed tocopherols), zinc sulphate, L-tryptophan, potassium citrate, potassium chloride, potassium hydroxide, potassium iodide, sodium selenite, nicotinamide, calcium D-pantothenate, copper sulphate, ascorbyl palmitate, thiamin hydrochloride, manganese sulphate, pyridoxine hydrochloride, retinyl acetate, folic acid, phylloquinone, D-biotin, cholecalciferol, riboflavin, cyanocobalamin. The protein source in Biostime® SN-2 BIO PLUS™ Premium Organic Follow-up Formula is derived from cow’s milk. Contains milk and soybean products.